Last month I've attended two Pilates teacher training courses - Pre/Post Natal Pilates (via The Center for Women's Health) on the first weekend of May, and the last weekend of May my third (and last) module of the Trapeze Table, Chair and Barrels (via Balanced Body University) - both held at Meridian Pilates. So it's natural that Pilates is on my mind, and being who I am, I'm always thinking of ways to incorporate enticing scents into life, even if just in a functional manner. Pilates studios share their space and equipment with many participants who hopefully break into sweat during the session, not to mention a fair amount of coughing and sneezing depending on the season. For hygienic reasons, each piece of equipment needs to be wiped out after each session. Most places use some random disinfectant or another. Few put any thought about the scent of these sprays, which is unfortunate. While in the smaller Pilates studios there generally does not seems to be an issue with participants not wiping the equipment - they will do so much more eagerly if the spray has a pleasant scent. I've been to some places which used a combination of essential oil (usually tea tree seems to be involved - which is a good choice functionally speaking, as it combats all three microscopic enemies: bacteria, virus and fungi). It does not smell wonderful though. Most essential oils only target one or the other, or for the most just bacteria and virus but not fungi. The anti-fungal is important not just because no one wants to get Athlete's Foot, but also because most buildings here are essentially made of cheap plywood, and it's so wet here year-around that mould likes to settle in and take over, especially in the winter. 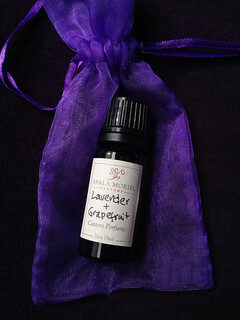 Therefore, it is nice to get a blend that can be added to a cleaning solution inside the spray bottles; but also used as is in a diffuser to also create atmosphere in the studio, get people to associate that scent with the feeling of rejuvenation and well-being they get at the end of the class and help them prepare for the session, and also address all those functional issues I mentioned above. This past week I've sat down with some ideas of what my ideal scent for a Pilates mat spray would smell like, and worked on a few versions. The first (which you see in the photo) is an elegant combination of clary sage, lavender and grapefruit, supported by various Earl Grey tea-like notes and a few other herbal accents to make it smell less boring and simplistic. I wanted to create something soft and with a hint of more feminine nuances but still not too flowery or aromatherapeutic. I think it's a nice start, and the owner of the Pilates studio that inspired it all seems to like it. I hope to smell it next time I'm there cleaning my mat!